In 1998, Jonathan Green was lead organizer for the Chicago New Party. The diverse and inspired overflow crowd stayed to the end of the remarkable celebration of People's World Amistad Award honorees Anna Montalvo, Gwen Mills and Art Perry on the occasion of the 90th anniversary of the Communist Party USA, Dec. 2009. The theme of the event was "Keep the Ball Rolling....to win jobs with union rights, health care, peace and equality!" Unity and struggle were the messages of the day. Working Families Party director Jon Green and State Rep Gary Holder-Winfield presented the citations to Art Perry, Connecticut political director of SEIU 32BJ Justice for Janitors . Joelle Fishman, chair of the Connecticut Communist Party, presented the Amistad Award, remembering when they first met over 30 years ago while Art was working at Southbury Training School and the successful struggles to keep the facility open. She emphasized Art's deep commitment to the power of working people, and as political director has never lost that connection to the members he serves. In accepting, Art had many thanks to family, friends and co-workers and said that no matter what comes, this award will always be his highest honor. The 90th anniversary of the Communist Party proud was done proud! At a late 2015 private dinner in Manhattan, a small group of leftists plotted to take over America. The group, a dozen community organizers and activists from all over the country, had convened at a sushi restaurant in the Flatiron District with the leaders of the New York-based Working Families Party. 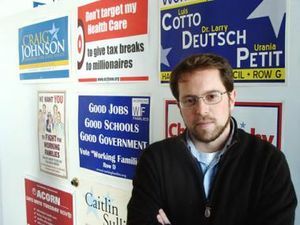 They were heads of organizations from Boston to Albuquerque, and included National People’s Action and Washington Community Action Network.They were there to hear "why their states should form their own chapters of the insurgent party, in order to capitalize on the country’s rising liberal tide and push the national conversation leftward". This page was last modified on 12 December 2017, at 04:38.